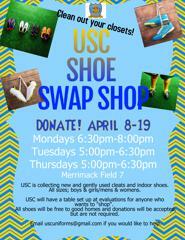 USC Shoe Swap Shop- Donate used cleats &amp; indoors! Have outgrown cleats and indoor shoes collecting dust? Donate them to the USC Shoe Swap Shop! USC will be collecting new and gently used cleats and indoor shoes (girls and boys, youth through adult!) April 8 through April 19, 2019. There will be a table set up at Evaluations in May for anyone who wants to "shop" for cleats and indoors....All items will be FREE, and donations will be accepted, but are not required to pick up a pair or 2! 1. Clean out your closets, car, garage....you know, where all the outgrown shoes hide! 3. Tie the laces together to keep the pair together.